Meg Campbell is a wellness expert with nearly two decades of experience as a fitness coach, group exercise instructor, and nutrition specialist. She began her full-time freelance writing career in 2010, and writes extensively about nutrition, health, and medicine. Ms. Campbell divides her time between the United States and Argentina. Salad greens — the leafy green vegetables that are either too delicate for cooking or traditionally consumed raw — are a common staple for calorie-conscious dieters and healthy eaters alike. Although iceberg lettuce has long been America’s favorite salad green, there are more nutritious options available, including arugula. Also known as rocket (or sometimes rocket lettuce), roquette or rucola, arugula is a Mediterranean green with a distinct peppery flavor and aroma. Arugula provides numerous health benefits due to its high nutrient density. Like many of the darkest, most flavorful leafy green vegetables, arugula is low in calories, making it an excellent dietary choice when you’re trying to achieve or maintain a healthy body weight. With just 8 calories per 2-cup serving, fresh arugula has virtually no impact on your daily calorie allowance. At the same time, the nutrient-packed greens provide substantial amounts of vitamins A, K and C, folate, calcium, iron, potassium, magnesium and several beneficial phytochemicals. In fact, arugula scores just over 600 on the Aggregate Nutrient Density Index, or ANDI, a tool that ranks foods by nutrient density — or the amount of micronutrients provided relative to calorie content. According to the ANDI, arugula is among the top 10 most nutrient-dense foods — it’s almost 30 percent more nutrient-dense than cabbage and nearly 50 percent more nutrient-dense than cauliflower. This means that adding arugula to your diet helps you control calories without sacrificing nutrition. Arugula is an excellent source of several nutrients that support eye health, including beta-carotene, a carotenoid your body can convert into vitamin A. Per 2-cup serving, raw arugula provides about 950 International Units of vitamin A, or 19 percent of the nutrient’s recommended daily value based on a 2,000-calorie diet. Getting enough vitamin A in your diet promotes good vision, particularly at night — vitamin A is essential to your ability to see in low light. Arugula also contains substantial amounts of lutein and zeaxanthin, two other carotenoids that support eye health. Along with beta-carotene, lutein and zeaxanthin may help protect against age-related macular degeneration, which is a leading cause of blindness among older adults. According to the National Institutes of Health, people with macular degeneration who boosted their intake of lutein and zeaxanthin through supplementation were more likely to avoid advanced macular degeneration. Arugula contains significant amounts of the three specific minerals that help control your blood pressure — calcium, magnesium and potassium. All three play an important role in helping your blood vessels to relax, thereby promoting healthy blood pressure levels. 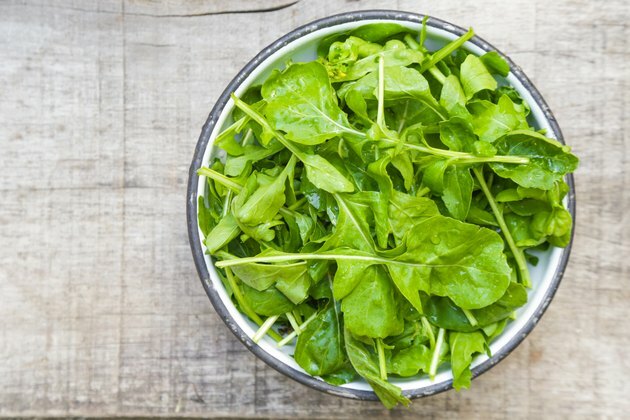 Although arugula isn’t a top source of potassium, it does boost your intake of the nutrient — a 2-cup serving contains about 150 micrograms, or roughly 3 percent of the 4,700 micrograms of potassium recommended for healthy adults. Arugula is richer in calcium and magnesium — a 2-cup serving of the leafy green vegetable provides 6 percent and 5 percent of the recommended daily values for calcium and magnesium, respectively, based on a 2,000-calorie diet. The fact that arugula contains a combination of nutrients known to help normalize and control blood pressure levels makes arugula a heart-healthy food, as high blood pressure can increase your risk of having a heart attack or stroke. Arugula is also a good source of folate, providing about 10 percent of the nutrient’s recommended daily value based on a 2,000-calorie diet. Folate, which is the natural form of folic acid, is most often cited for the important role it plays in fetal development, as pregnant women who are deficient in this important B vitamin are at a higher risk of giving birth to babies with birth defects. Folate also plays an essential role in amino acid metabolism. A lack of folate can elevate your homocysteine levels, and having too much of this amino acid circulating in your blood can increase your risk of heart disease. Arugula — along with watercress, cabbage, collard greens, broccoli and Brussels sprouts — is a cruciferous vegetable. As such, it’s an excellent source of glucosinolates, the sulfur-containing compounds that give the leafy green its peppery flavor. When you chew arugula, its glucosinolates are broken down into indoles, isothiocyanates and other biologically active compounds. According to the Linus Pauling Institute, the compounds derived from glucosinolates may help your body get rid of carcinogens before they have a chance to damage your DNA, and they may also affect hormone activity in ways that impede the development of hormone-related cancers. Although research is ongoing, some epidemiological studies have shown that diets rich in cruciferous vegetables may specifically help reduce the risk of colorectal and lung cancers. Arugula is also rich in flavonols, a subclass of flavonoids. Although exploring the potential health benefits of flavonoids is also an ongoing area of research, animal and in vitro studies have shown that they demonstrate anti-cancer — as well as anti-inflammatory and anti-diabetic — properties.